No, it's not drastically different. There are just a few mod links in different places that pop up dialogues to allow us do things like merging, locking (etc) that aren't in the standard close/delete menus. I'd show you these but they're really very dull. Edit: I'm adding some screenshots of some of the screens. Most are fairly self explanatory. 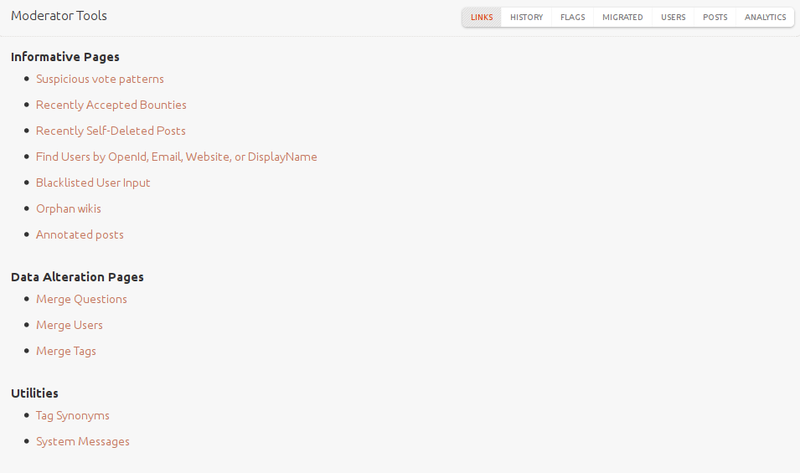 There's also a mod screen (like review) that tells us about the new flags and lets us action them. We're not allowed to show these screens because they contain identifying information. Right now I just need you to go over there and stand on that patch marked "Definitely not a trap-door". We'll make it quick but can't promise it will be painless. I'm not really allowed to show you any more than this but it should give you an idea about what's in there. If you want to get a real insight into the daily work of the moderators, the moderator newsletter is available to everyone. It talks about all of the new features, changes in policy and so on. The site get more features the more reputation you earn. 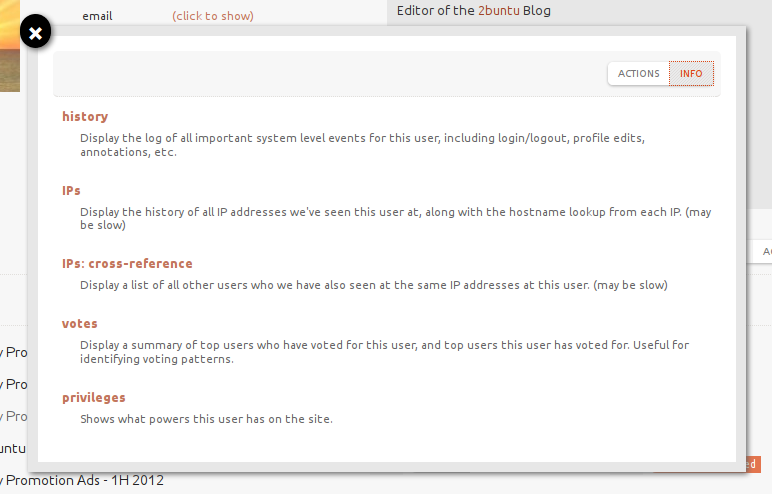 To a moderator, the site looks more or less like it does to a user with 10,000 reputation. 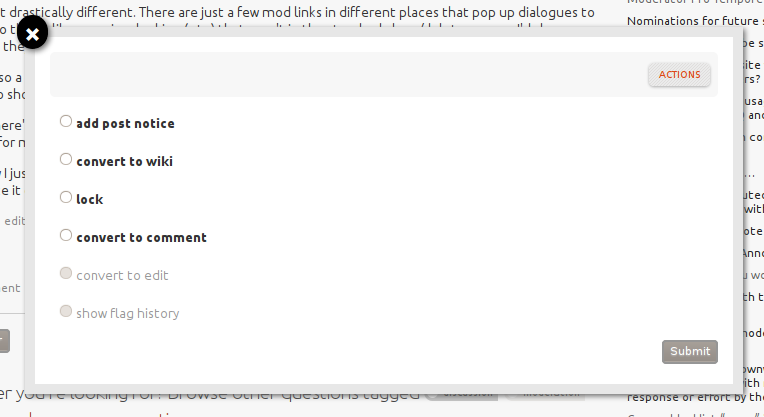 The mod link point to the Moderator Tools, And the tools link is the same as the 10K tools. In the moderation tools, we can do various janitorial things. There are some interfaces for things like System Messages (the messages you see atop every page sometimes, like when there's an election), merging user accounts, and creating tag synonyms. And that's pretty much all of the stuff we use. At the bottom of every answer, the links are the same as they are for a 10K user, plus a mod item where we can Merge questions, protect them, convert answers to comments and so on. As you can see, apart from the ability to actually affirm or invalidate moderator flags, plus some small things like the ability to email users directly, 10K users can do pretty much the same things. 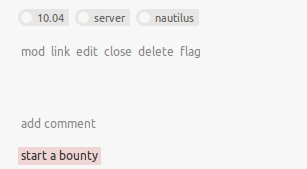 Remember that we spend 90% of the time on the Flags page (which looks just like the 10K flag page at tools → flags). 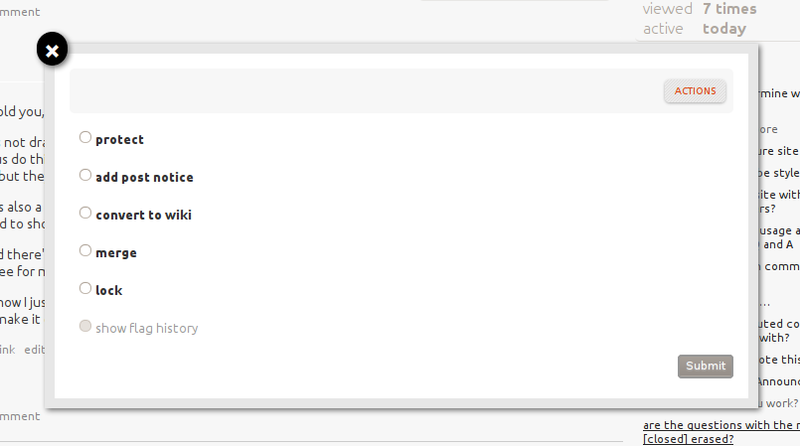 Clicking on a question, sorting it out (i.e. deleting an answer, adding a comment, downvoting, upvoting, ...) and repeating that process until there are no more flags left (for about 20 seconds). We (as moderators) can put a room into a timeout - this is generally used for a short period of time as a "hey guys, you're waaayyyy off topic, so lets take a minute to cool down and then we can move on". 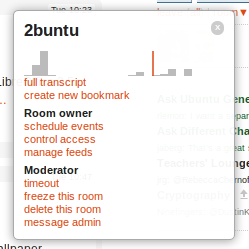 We can freeze a room - this means that all non-moderators cannot talk in the room, but moderators can. We can delete a room - this takes it away from the public eye, but we can bring it back. Message admin lets us migrate messages from one room to another - lets say we get super chatty in the main room about a specific topic - we can migrate the messages to a new room specifically for that topic. 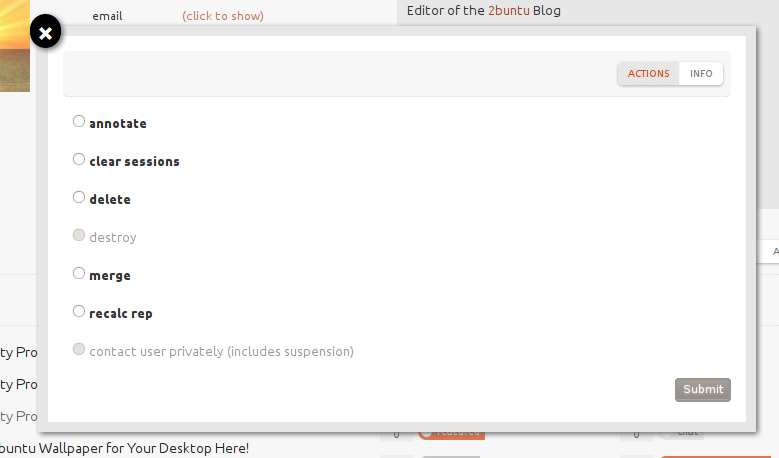 Here we have options about what to do with a user. 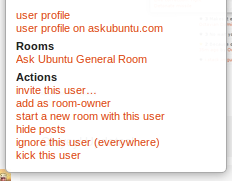 We can add them as a start a new room with this user, hide posts and ignore this user just like a normal user. But, we have a "add as room-owner" button, as well as a "kick this user" option.